I really love this pattern. It was so easy to knit, and really neat and tidy. All my little stitches lined up so perfectly. I dyed the yarn, which I call Spearmint, in shades of blue-ish greens. 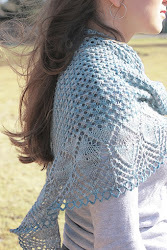 I think that it makes a lovely leafy-lace sock. All in all, I'm quite pleased with myself. Doesn't she look happy!? 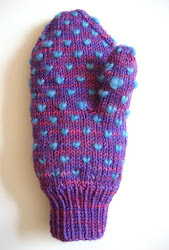 They are a combination of the fleece artist thrummed mittens kit pattern, and my own modifications. I like a ribbed wrist band, and neat snug mitts. 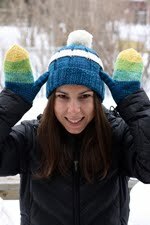 I'll definitely be making thrummed mitts again! Well, it's been a long time coming, but I've finally decided to attempt to write a blog. 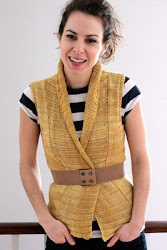 I've been considering it for a while, I read knitting blogs and am always interested in what other people are up to. I don't have many friends in the real world who knit, so I've become heavily dependent upon bloggers for my daily knit dose. It only seems fair that I should contribute something to the conversation and share my knitting adventures too. 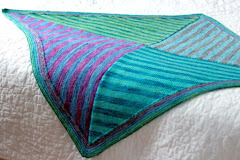 It's not all knitting over here, I sometimes sew and do other artsy/crafty things. There's also a hell of a lot of yarn dyeing going on these days. I graduated from university with a degree in Fine Arts a couple of years ago, and I've finally decided how to put it to good use. I'm selling my hand died sock yarns on etsy. So much fun. Now the part that everyone's interested in... what's currently on my needles. I've got a lot going on, I'm knitting 2 afghans, one is still in the very beginning stages and the second, my lizard ridge afghan is almost done being seemed. So I'll have some pics of that up soon. I'm also working on my very own bohus. I feel as though it's like a right of passage in the knitting world. I'm almost done the colourwork, but to be honest, that may be on the needles for a while still because I've kind of put it aside for now. My main preocupation these days is socks. I don't even know how many pairs of socks I've knit to date, I often give them away, because even though I live in Montreal, which has a very cold climate, definitely wool sock worthy, and I've literally worn hand knit socks everyday since October, I knit more then I could ever need, with no intention of stopping, so I tend to give them away to relatives with the same size feet as me. So, that's my little intro. I don't plan to make picture-less posts often, but I just wanted to get a first post up today. Tomorrow I'll have photo's of another first. My first thrummed mittens, I should finish them tomorrow. They're beautiful.